Willie Auchterlonie set out the original fairways at Carnwath in 1907 and this initial 9-hole layout was doubled in size some fifteen years later. In the early 1960s, when the club acquired additional land on the south side of the property, GM Clark, who was a club champion around that time, redesigned the course. The club logo includes a figure of Carnwath motte, built by the Somerville family in the 12th century. It’s a substantial mound, around thirty feet high, which was probably built to defend an old ford of the Carnwath Burn. It’s an imposing feature that’s hard to miss as it occupies a prominent position immediately behind the first green. A round at Carnwath begins in rather unconventional style, with par threes played at the first two holes. It may sound a little strange but this arrangement works quite well, with holes merely accommodating the land that’s available around the clubhouse. In fact, most of the course (holes 3 to 15) is set out on the other side of the A70. Even then, space is tight in places on that side of the road, where the 8th fairways crosses both the 7th (near the green) and the 12th (close to the tee). Holes 9 and 11 also cross over but there’s never any real danger from stray shots. Nevertheless, it pays to have your wits about you when playing the six holes between the 7th and 12! Toughest hole on the front nine is probably “Lang Whang,” the long par four 8th, which doglegs uphill and left, leaving a blind approach to a plateau green. On the inward half, there’s a lovely sequence of holes between the 13th and 15th, with “Burnhouse” at the short par four 14th the best chance of picking up a birdie. Good to see my friend Jim McCann discovering some of the roads less travelled to the lesser-known courses of his native land. I am afraid I can not share his enthusiasm for Carnwath, a course I know well. I am not a fan of par 3 opening holes, especially when -as here- it is uphill. I am not keen either on the two short holes that follow at 2 and 4. There are some interesting holes in the middle part of the course with significant changes of elevation that afford wonderful views of Tinto and the surrounding countryside. Unfortunately there are too many quirks in terms of cross-over fairways and blind shots. On crossing back over the road towards the finish the silly 16th is followed by two good holes notably the excellent 18th with a burn all along the left. I am surprised to see Carnwath in the latest Lanarkshire top 10. It is not in mine. 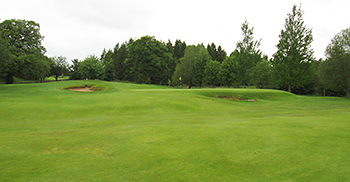 Carnwath was another course that would not have been on my radar if it wasn’t for its inclusion in the recently updated Top 10 chart for Lanarkshire. There’s a really unusual start with three par threes in the first four holes which, on paper, is really weird but they fit the contours really well and it doesn’t feel that awkward setting out on a round in such an unorthodox manner. The 161-yard downhill 4th is a particularly good short hole, making excellent use of a bunker that’s built into a ridge in front of the green, forcing a tee shot carry all the way to the putting surface. The 8th is another terrific hole on the front nine, played uphill to a blind green that’s set out on top of a hill. The course routing goes off the rails a bit when holes 9 and 11 cross over but it gets back on track at the 12th, at the start of a nice little series of short par fours. The closing three holes, like the opening three holes, are played out on the clubhouse side of the main road that runs through the course and they present a tidy finish to the round, especially the penultimate hole, which is a strong 455-yard par four. A cryptic note in my scorecard mentions “grass-faced bunkers” and I’m glad for that memory aid as it’s worth mentioning Carnwath’s sand traps were truly constructed to a very high standard. It may never make a national Top 100 chart but, to my mind, the course well deserves a place in the regional listings, effectively giving it an entry into the “next 100” chart for Scotland.